exist in this world?” I was aware I was not the first person to ask this question. I spent considerable time over many years, studying the traditional Christian answers to this very central question. I found the Vipassana Buddhist answers to such questions to be refreshingly different but I was not convinced their general conclusion there is no God was quite the right answer either.I began a serious study of meditation 25 years ago, without being sure what I really believed. 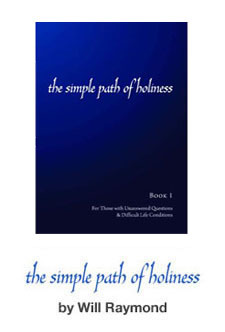 A strong intuition that silent meditation could help me in many ways was enough to begin.In 2003 I began writing the Simple Path of Holiness as my way if working out alternative answers to my core question of the relationship between God and human suffering. As I worked on the book over a 7 year period and deepened my study of both Catholic, Buddhist, and Greek Orthodox meditation something unexpected happened. Instead of coming up with answers to the core question I had been working with for so long, I developed a way to teach meditation that worked just as well for people whether they believe in God or not or are not sure what to believe. This is because the practices are general enough they can be adapted to your current beliefs and way of life. They are effective enough that they will help you work through whatever you may be stuck on. Please consider taking any one or all three of the Online Work Shops for free. The excerpts and the Work Shops will give you a good sense as to the tone and process of the commentary and the work of the individual chapters. Please let me know what you think once you have a chance to review some of the excerpts and Online Workshops.